Capital of Galicia, Austria; 180 miles east of Cracow and 60 miles from the Russian frontier. Its population in 1869 was 87,109 of whom 26,694 were Jews; in 1890 it was 127,943, including 36,130 Jews; in 1900 there were 44,801 Jews in a total population of 159,618. The history of the Jews of Lemberg dates from its foundation in the middle of the thirteenth century. The Jews were among the first settlers, with Ruthenians, Armenians, Tatars, and "Saracens"; they even preceded the German and Polish immigration. These "Saracens" were Karaites, a remnant of the Byzantine Chazars, who migrated from Asia Minor to Ruthenia and Lemberg. The city's records of 1356 distinguished the Karaites as "Saracens" and other Jews as "Judæi" (comp. Sokolow, "Sin'at 'Olam," p. 82, Warsaw, 1882). German Jews expelled from their fatherland settled in Lemberg after its capture by Casimir the Great (1340), who gave the Jews equal rights with the Christians. The Jews of Lemberg enjoyed the same rights under Casimir's successor, Ludwig of Anjou. Originally, the Jewish quarter was located within the city walls, on the southwest side. The Jews that came later took up their abode outside the walls, in the environs. For a long time the congregation in the city had its own rabbinate, independently of that of the Jews outside; but about the beginning of the seventeenth century they were united under a chief rabbi, with a special bet din for each congregation. Under Casimir IV. (1447-91) the Jews of Lemberg obtained certain privileges on payment of an exorbitant tax to the king. A general conflagration which visited Lemberg on Aug. 5, 1494, destroyed most of the Jewish dwellings. The Jews were permitted to rebuild on easy terms and, as an inducement to stay, were released from part of their taxes. Under Sigismund I. the Jews of Lemberg engaged in many commercial enterprises, but the German merchants, fearing Jewish competition, induced the Polish noblemen to check the Jewish expansion of trade. In 1521 the magistrate of Lemberg joined the magistrates of the neighboring cities in a petition to the king to abrogate all commercial privileges enjoyed by the Jews. 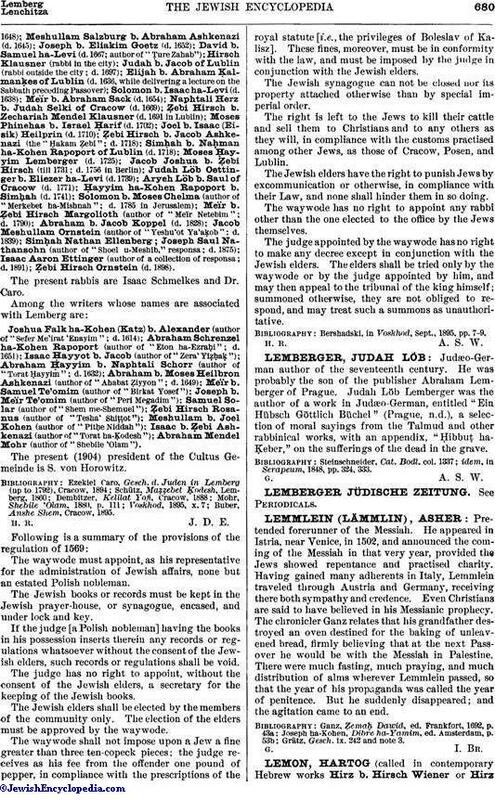 In a letter from the magistrate of Lemberg to that of Posen the Jews are referred to as "infidels and dangerous competitors of Christian merchants." The Cracow diet was induced to propose such measures "to save the Church from ruin." The king, however, refused to sanction them. In his veto he maintained that the Jewish commercial activity was essential to the welfare of the community at large. It was shown that out of a total of 3,700 merchants in Lemberg only 500 were Christians; that the Jews lived economically and were satisfied with small gains, while the Christians were spendthrifts and extorted large profits from purchasers. Furthermore, the Jews promoted a large export trade with Wallachia and Asia Minor, which exceeded the imports and thereby drew money into the country. Jewish business privileges then extended only to the sale of wax, leather, and cattle. The sale of cloth was not permitted them, except at regular fairs. Yet the Jewish merchant was indispensable to the inhabitants of Lemberg; even after the fire in 1527 it was necessary to promise the Jews twenty years' immunity from taxes and to extend their cattle-dealing privileges from 500 to 2,500 head per annum to each dealer as an inducement to them to stay in Lemberg. Moses Niemiec was made a citizen in return for his conveying a piece of ground to the city authorities for the erection of a public building. Certain privileges and restrictions of trade passed by the diet in 1581 were renewed in 1592 (see Caro, "Gesch. der Juden in Lemberg," p. 37). While the Jews in Lemberg suffered restrictions in business, they were not subjected to religious persecutions. Indeed, the Ruthenians suffered just as severely from trade restrictions. It is to the credit of the magistrate of Lemberg that he protected the Jews against the force sent by Pope Pius II., in 1463, under one Szczesny, to aid Hungary in her struggle against the Turks. Szczesny's soldiers would have slain the Jews, but the magistrate of Lemberg shut the gates against them until the Jews had secured themselves by the payment of a ransom. 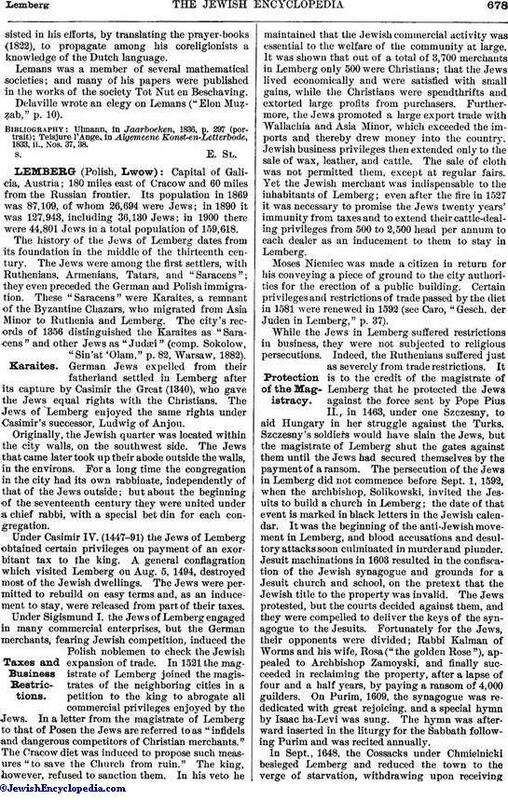 The persecution of the Jews in Lemberg did not commence before Sept. 1, 1592, when the archbishop, Solikowski, invited the Jesuits to build a church in Lemberg; the date of that event is marked in black letters in the Jewish calendar. It was the beginning of the anti-Jewish movement in Lemberg, and blood accusations and desultory attacks soon culminated in murder and plunder. Jesuit machinations in 1603 resulted in the confiscation of the Jewish synagogue and grounds for a Jesuit church and school, on the pretext that the Jewish title to the property was invalid. The Jews protested, but the courts decided against them, and they were compelled to deliver the keys of the synagogue to the Jesuits. Fortunately for the Jews, their opponents were divided; Rabbi Kalman of Worms and his wife, Rosa ("the golden Rose"), appealed to Archbishop Zamoyski, and finally succeeded in reclaiming the property, after a lapse of four and a half years, by paying a ransom of 4,000 guilders. On Purim, 1609, the synagogue was rededicated with great rejoicing, and a special hymn by Isaac ha-Levi was sung. The hymn was afterward inserted in the liturgy for the Sabbath following Purim and was recited annually. In Sept., 1648, the Cossacks under Chmielnicki besieged Lemberg and reduced the town to the verge of starvation, withdrawing upon receivingan enormous ransom, a considerable part of which was paid by the Jews. The Jesuits concocted another blood accusation in 1728, and incited the followers of Shabbethai Ẓebi, the false Messiah, against the Jews in Lemberg. The Frankists had been solemnly excommunicated by the rabbis of Lemberg in 1725; the Jesuits, therefore, induced the Frankists to revenge themselves by embracing Christianity and accusing the Jews of using Christian blood for the Passover service.The canon De Mikulski later arranged for a disputation in Lemberg in June, 1759, between the rabbis and the Frankists, which resulted in renewed persecution of the Jews of Lemberg. Lemberg was, also, a center of modern Ḥasidism; but such men as Joseph Perl (1773-1839) and Solomon Löb Rapoport (1790-1807) opposed the movement, the former by the establishment of a model high school for Jewish and secular instruction and with his persuasive pen, especially in his "Megalleh Ṭemirin," written in a peculiar Hebrew jargon, and exposing the methods of the Ḥasidim. Rapoport founded a literary circle with a library supported by Judah Löb Mises (d. 1831), thus providing ambitious young men with a liberal education. Lemberg is well provided with Jewish institutions. The first synagogue was built by the Karaites in 1582. The Ashkenazic synagogue, the title to which was contested by the Jesuits, followed in 1632; this ancient building has capacious vestry-rooms that are now used as separate synagogues. Since the Karaites removed from Lemberg their synagogue has been occupied by Rabbinite Jews. 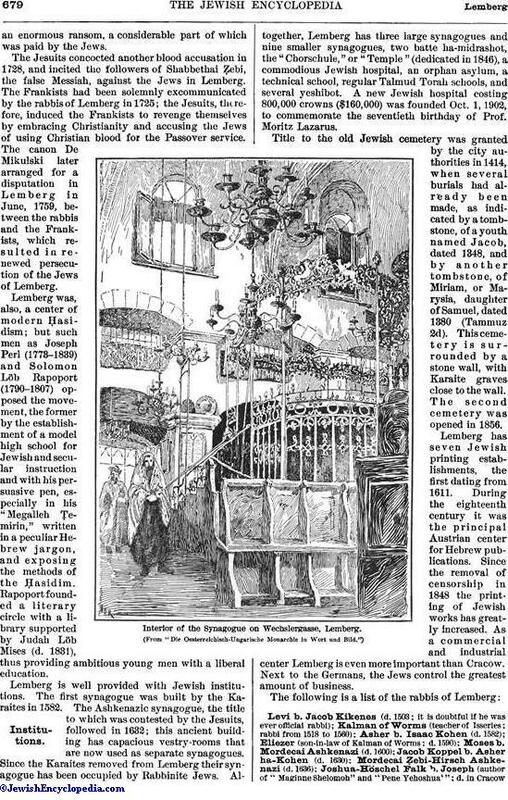 Altogether, Lemberg has three large synagogues and nine smaller synagogues, two batte ha-midrashot, the "Chorschule," or "Temple" (dedicated in 1846), a commodious Jewish hospital, an orphan asylum, a technical school, regular Talmud Torah schools, and several yeshibot. A new Jewish hospital costing 800,000 crowns ($160,000) was founded Oct. 1, 1902, to commemorate the seventieth birthday of Prof. Moritz Lazarus. Title to the old Jewish cemetery was granted by the city authorities in 1414, when several burials had already been made, as indicated by a tombstone, of a youth named Jacob, dated 1348, and by another tombstone, of Miriam, or Marysia, daughter of Samuel, dated 1380 (Tammuz 2d). This cemetery is surrounded by a stone wall, with Karaite graves close to the wall. The second cemetery was opened in 1856. Lemberg has seven Jewish printing establishments, the first dating from 1611. During the eighteenth century it was the principal Austrian center for Hebrew publications. Since the removal of censorship in 1848 the printing of Jewish works has greatly increased. As a commercial and industrial center Lemberg is even more important than Cracow. Next to the Germans, the Jews control the greatest amount of business. 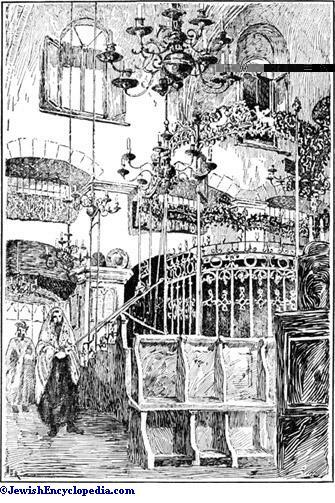 Interior of the Synagogue on Wechslergasse, Lemberg. Ẓebi Hirsch Ornstein (d. 1898). The present rabbis are Isaac Schmelkes and Dr. Caro. Abraham Mendel Mohr (author of "Shebile 'Olam"). The present (1904) president of the Cultus Gemeinde is S. von Horowitz. Buber, Anshe Shem, Cracow, 1895. H. R. J. D. E.
The waywode must appoint, as his representative for the administration of Jewish affairs, none but an estated Polish nobleman. The Jewish books or records must be kept in the Jewish prayer-house, or synagogue, encased, and under lock and key. If the judge [a Polish nobleman] having the books in his possession inserts therein any records or regulations whatsoever without the consent of the Jewish elders, such records or regulations shall be void. The judge has no right to appoint, without the consent of the Jewish elders, a secretary for the keeping of the Jewish books. The Jewish elders shall be elected by the members of the community only. The election of the elders must be approved by the waywode. The waywode shall not impose upon a Jew a fine greater than three ten-copeck pieces; the judge receives as his fee from the offender one pound of pepper, in compliance with the prescriptions of the royal statute [i.e., the privileges of Boleslav of Kalisz]. These fines, moreover, must be in conformity with the law, and must be imposed by the judge in conjunction with the Jewish elders. The Jewish synagogue can not be closed nor its property attached otherwise than by special imperial order. The right is left to the Jews to kill their cattle and sell them to Christians and to any others as they will, in compliance with the customs practised among other Jews, as those of Cracow, Posen, and Lublin. The Jewish elders have the right to punish Jews by excommunication or otherwise, in compliance with their Law, and none shall hinder them in so doing. The waywode has no right to appoint any rabbi other than the one elected to the office by the Jews themselves. The judge appointed by the waywode has no right to make any decree except in conjunction with the Jewish elders. The elders shall be tried only by the waywode or by the judge appointed by him, and may then appeal to the tribunal of the king himself; summoned otherwise, they are not obliged to respond, and may treat such a summons as unauthoritative. Bershadski, in Voskhod, Sept., 1895, pp. 7-9.